When we think of airlines, we tend to envision the pilots and the flight crew—the personnel who do the actual flying with the passengers, and who get to do the glamorous stuff like jetting across the globe. But the ground crew, who tackle the carting, loading, and unloading of mail, freight, and baggage, the deicing of aircraft and cleaning of windshields and air-conditioning systems, who service the airlines' vehicles (among a myriad of other tasks), perform equally indispensable roles. Philip Bilgray has worked as a Ramp Serviceman for United Airlines since April 15, 1986, the first of his kind. It's a physically and mentally demanding job, and not without its exciting moments. He loves his work and being part of a well-coordinated crew. "Philip Bilgray is a dear friend of mine since we were children growing up in Brooklyn, New York. (We go back 48 years. Our parents have been friends since they were 6. All from Brooklyn.) Philip has always had a love for airplanes and had a dream of one day being a pilot. He had one barrier. Philip was completely deaf. "I remember as a child how he would constantly look to the skies for the hope of seeing a plane. Something he does to this day, except now he can tell you what plane it is, what airline, and whether it is on time or not. He is amazing. "He once wrote to Frank Borman, then CEO for Eastern Airlines, asking to fly the planes for Eastern. I remember when he received a letter back from Mr. Borman. It made his day. "He lives and breathes the airline industry. He has worked for United Airlines for close to 25 years as the only deaf employee that works Ramp Services. He is the ideal employee. He has a work ethic like non-other. Don't believe me? Call the CEO of United who knows Philip personally. Ask his supervisors. Ask his fellow employees. Ask the people who fly out of Tampa. Everyone knows and loves Philip. He is a unique individual who has overcome obstacles to make a life for himself. He takes pride in what he does. He loves United more than anyone. "So it is with honor and pride that I nominate Philip Bilgray for recognition in your publication. He is a personality worth highlighting. I promise." Born deaf, Philip Bilgray was the only deaf person in his family. As his father, Seymour, told us, "Philip attended P.S. 47 [New York City's only public school for the deaf] until the 6th grade, then transferred to P.S. 204, a hearing school where he was helped with speech communication from his both teachers and fellow students. We moved to Florida in 1973 and Philip attended Driftwood Middle School and graduated from Nova High School. (He was the Varsity Basketball Manager.)" 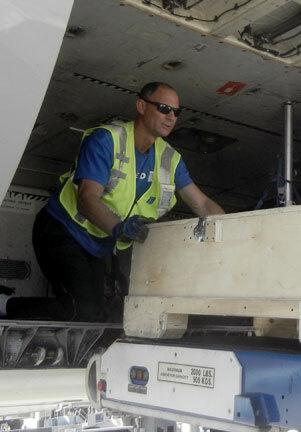 Bilgray originally started working at Fort Lauderdale Airport with Aircraft Service International Corporation, a ground-services company contracting with United Airlines, around October 1985. Here was there around 7 months, Seymour told us. "The station supervisor noticed Philip's work ethic and attitude to his job performance and suggested he fill out a job application. His application was received with some reluctance due to his being deaf. However, Philip was flown to the Chicago home office of United Airlines for an interview and hearing evaluation by their doctors. "He was accepted for employment with United Airlines and started working at Fort Lauderdale. (Ramp Servicemen are in the International Association of Machinists and Aerospace Workers union.) He then was transferred to Washington Dulles Airport [in 1986] by a recommendation from his supervisor and remained in Washington for 13 years before transferring to Tampa in May 1999, [where he's been working since]." He's been there 12 years. Although he's United's first deaf Ramp Serviceman, he's found that being deaf is hardly a disadvantage. Since airports can be ear-splittingly noisy, Ramp Service crew typically use hand signals to communicate with each other, and Bilgray has taught his co-workers some simple sign language, making on-the-job communication even better. As for driving a tug (the open-air carts that pull trains of stacked luggage or freight), he's especially alert, as he can't hear other tugs approaching. He's said, "With aircraft and other vehicles everywhere, making the extra effort to constantly look around ensures that I'm upholding our corporate value: Safety at all times, in all things." He has received commendations on his above-and-beyond service. On a flight that where Bilgray was a passenger, a fellow passenger took ill, the flight attendants asked for any assistance, Philip volunteered and helped administer oxygen. Paramedics took care of the sick passenger (who wasn't in a life-threatening situation) when the plane landed. Seymour told us, "The pilot was required to file a report of the incident and that is how it became noted and a commendation was given to Philip. During Bilgray's 9 years at Dulles, he willingly participated in the pre-holiday Christmas Fantasy Flight—a special event for terminally ill children. As Seymour explained, " They are taken aboard a plane for a simulated flight to the 'North Pole' to meet Santa Claus and are treated with gifts, etc. This is strictly on a volunteer basis by the United employees giving up their free time. "Philip feels wonderful being a part of United Airlines. He says, 'They are the biggest and the best in the world.'"